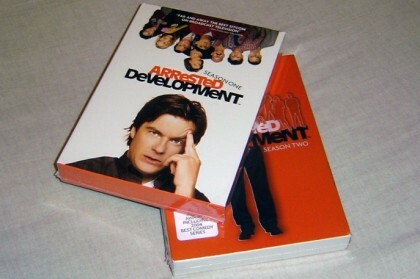 I know I said that I wanted the Arrested Development Season 1 DVD like forever ago (ok, it was May:p), but I finally got around to ordering it. And since Season 2 is out, I got that, too:) Easy decision! Not only is Arrested Development one of the funniest things on tv, it’s actually better to watch a bunch in a row. We like to save like 5 on our Replay, then watch ’em all together:) Also, Amazon has a deal where if you buy seasons 1 and 2 together, you get 10 bucks off. Ooooh yes!